Luminosity masks select tonal ranges in the image based on the brightness values of individual pixels. The original luminosity masks tutorial described how to use intersection and subtraction to create series of masks that targeted Light, Midtone, and Dark tonal ranges. Additional tonal ranges were added with zone masks, which used specific subtractions of the Lights and Darks masks. The recently released TKActions V4 panel uses calculations to make “16-bit” versions of these masks. These are all variations on the same theme, namely finding ways to select tones in the image for adjustment, painting, or blending. 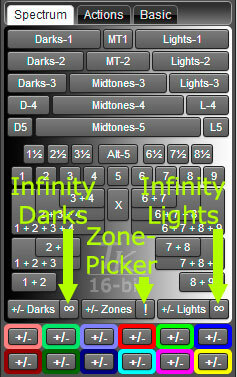 The latest update to the TKActions V4 panel adds two new options: the Infinity MaskTM and the Zone-PickerTM. While these expand the ways for creating luminosity masks and selections, for some photographers they will also simplify the process of choosing which mask to use. An Infinity Mask uses a Levels adjustment layer to simulate the Lights- and Darks-series luminosity masks. Which pixels are selected, how strongly (or weakly) they are selected, and the feathering from selected to non-selected pixels are all controlled in real-time by the user. 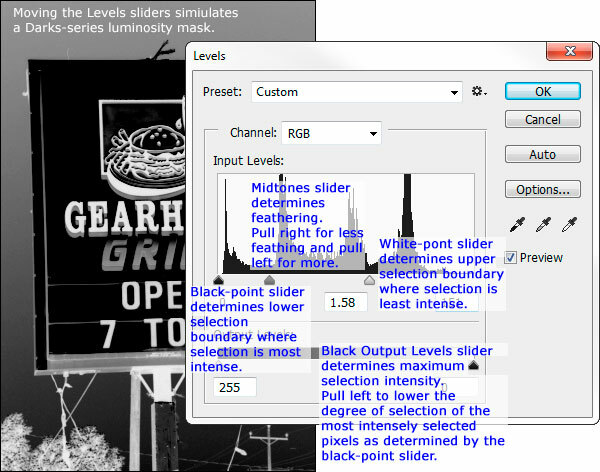 Instead of a number of defined Lights and Darks masks, the possible number of luminosity masks created via the Levels dialog is infinite. Fortunately, the real-time environment for creating the Infinity Mask makes it possible to quickly narrow the selection to the pixels the photographer wants to control. 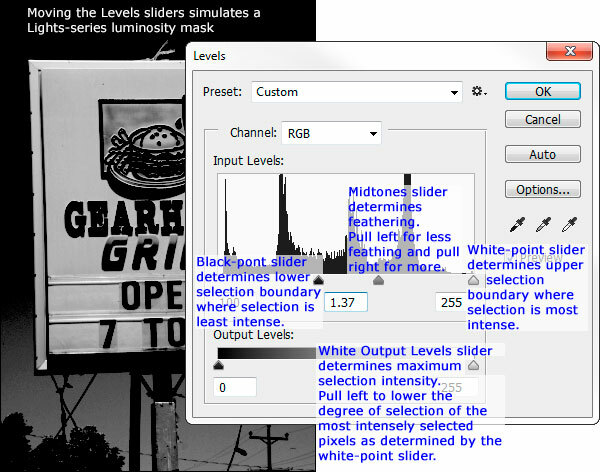 The familiar white-reveals/black-conceals mask image is presented for evaluation, and adjustments to the Levels sliders instantly update the mask image. Infinity Lights. The on-screen image changes to the Lights-1 luminosity mask. Adjusting the black-point slider by moving it to the right (to choose the lower dark boundary for the selection) and midtone slider (to adjust the feathering) is usually sufficient to create the desired selection. There are additional adjustments available as describe below. Clicking “OK” in the Levels dialog window creates a mask and corresponding selection to match what is being viewed on the monitor. Infinity Darks. 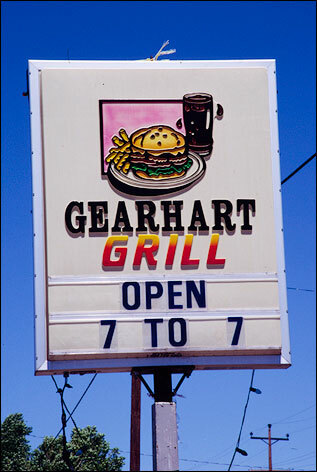 The on-screen image changes to the Darks-1 luminosity mask. Adjusting the white-point slider by moving it to the left (to choose the upper light boundary for the selection) and midtone slider (to adjust the feathering) is usually sufficient to create the desired selection. There are additional adjustments available as describe below. Clicking “OK” in the Levels dialog window creates a mask and corresponding selection to match what is being viewed on the monitor. The Zone-Picker helps take the guesswork out of finding the right off-center midtone mask to target specific tones in the image. It uses Photoshop’s Color Picker tool. When the Color Picker opens after clicking the Zone-Picker button, the Eye Dropper tool becomes active allowing the user to choose a color/tone from the image. Once chosen, clicking OK runs an action that automatically chooses among 23 different tonal zones to find the one that most closely matches the chosen tone/color. The available choices are similar to the zone and half-zone buttons on the Spectrum tab of the V4 panel, but a bit narrower and more focused. The luminosity masks/selections created by the Zone-Picker are NOT simulated luminosity masks. They are calculated directly from Lights- and Darks-series masks, and so are themselves 16-bit luminosity masks based entirely on the pixel brightness values of the image. 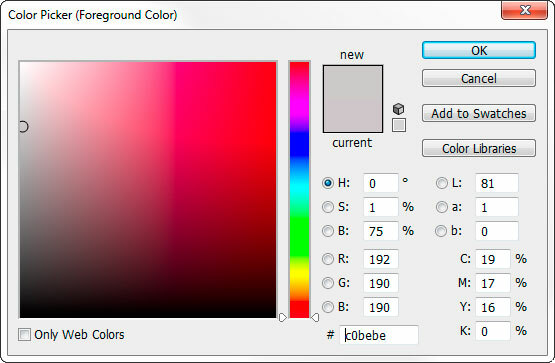 The Zone-Picker dialog window itself can be used to choose a color/tone instead of selecting a color/tone from the image. In fact, the dialog window allows two new series masks to be created. Picking pure white (255, 255, 255) produces a Lights-6 selection/mask and picking pure black (0,0,0) produces a Darks-6 selection/mask. Sean Bagshaw has recorded a video on how to use an Infinity Mask and the Zone-Picker. His application is slightly different from how I describe their use and application, which speaks to their adaptability in different workflows. The Infinity Mask and the Zone-Picker are additional ways to select tones in the image for painting, blending, and adjustment. These functions have been added to the Photoshop CC 2014/2015 version of the TKActions V4 panel. They will eventually be added to the CS6 version of the panel too, though it will take some time in order to include additional planned updates. NOTE: I’ve added a direct purchase link to the CC version of the TKActions V4 panel on my special offers page instead of linking to the Adobe Add-Ons website to get it. I continue to update the Adobe Add-Ons product with the current version, but Add-Ons has proven unreliable and I can no longer recommend it for the initial acquisition. When it works, Add-Ons is great, but when it doesn’t, the various workarounds are time-consuming and more trouble than most people want to deal with. The Burn/Dodge layers are no longer filled with 50% gray. They are transparent, which allows the painted pixels on the layer to be loaded as a selection and used for additional adjustments. Sean Bagshaw discusses the process in this video: https://www.youtube.com/watch?v=MCeZtmjjvXs. Layer bookmarking has been added. When actions in the panel require adding layers at the top of the Layers panel, the action automatically returns the user to the layer they were on before the temporary layers were added when the action is finished. This is most important with the “+/- View” button. A round trip using “+/- View” leaves the user back on their original layer to immediately start painting through the selection or to create a layer mask after finding the right selection. The “+/- View” button should now work in Lab mode as well as RGB mode. The color is a little more intense, but it still works. The mask generated by the “+/- View” button can now be toggled from red to blue. An extra layer has been added in view mode. 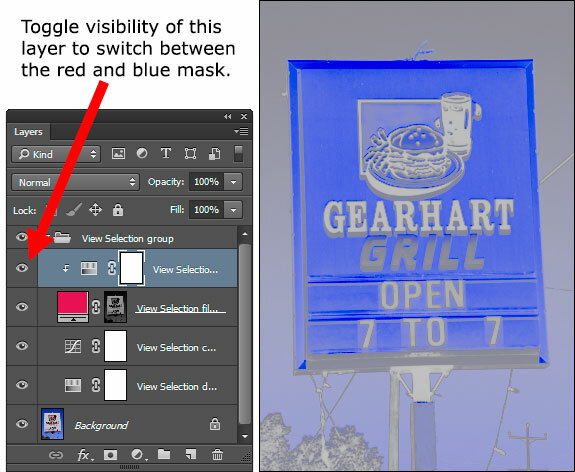 Turning “on” the visibility of this layer changes the red overlay mask to a blue mask. This is for people that have a hard time seeing the red overlay. NOTE: The phrases “Infinity Mask” and “Zone-Picker” were coined by Tony Kuyper and are trademarks of his products− Infinity MaskTM and Zone-PickerTM. I’m currently using the new V4 panel and would like to update it to the newest version with infinity masks etc. How do I do this as I’ve already purchased the V4 a few months ago? If you purchased from Adobe Add-Ons, the panel will update automatically for you provided that Add-Ons worked initially to install the panel. So check first to see if you already have the latest version of the panel installed on your computer by looking for the Infinity Masks buttons and the Zone-Picker buttons. Version 1.0.3 was released yesterday. You can also go to Add-Ons and click the “My Add-Ons” link on the left side to see your Add-Ons. If need be, you can run a Remove/Install cycle from there, allowing a couple of minutes between button clicks. If that doesn’t work, you can use the “Install issues?” link below the “Remove/Install” buttons, but it gets much more complicated from there. Yea, thanks-it’s updated. Nice additions! Yay! I just checked and my TK4 panel for CC automatically updated. Once again, Tony, you have outdone yourself. You think of everything! The new panel is a big winner. Intuitive and, once used to it, very very handy. The new tuts from Sean Bagshaw also are a big improvement over the first series: less theory and learning the things that really matter for photographers. As a long time user of TK’s luminosity masking, and someone who has done a lot of testing with Tony on the Mac platform, I have to say that V4 and the new infinity masking tools are just great! As a Photoshop instructor, I’ve always presented ways to “tweak” masks after they were created. The masks could have been created via the TK panel, or created on your own, but in either case, one method was to apply a Levels Adjustment Layer to the mask to drive the whites / blacks to one end or the other to help target the mask. Now with Infinity masking, you have the option to do that up front and get a great mask before you use it on an adjustment layer. Great work Tony! This is really useful. Any final tweaks that I want to apply to a mask are generally done with a black or white brush using an overlay blending mode on the brush. Really GREAT stuff.